It’s not possible to use all four colors one hundred percent, since paper can’t sustain great amounts of color. The maximum amount of color that can be applied on a coated paper is up to 340% and on an uncoated paper 280%. Spot colors are mixed before printing according to Pantone catalog. Spot colors are used to get specific shades that are difficult to achieve with CMYK colors. Many bright colors and special colors can’t be achieved using the four color process of CMYK. Spot colors are also used in addition to CMYK colors. Silver and gold are also spot colors. It’s important to know that one and the same color mixture can give different results when printed on different papers. When choosing a color, compare the same color mixture using pantone coated and uncoated fans. If the design is made thinking of the result on a coated paper and the order is later placed for uncoated paper, the result is significantly different. It’s recommended to print bar codes, QR codes with 100% K. If you need the code to be in color, ensure that the spot color is 100% or in case of CMYK, one of the colors must be 100%. In case of a raster, the code might end up being unreadable by scanners. When making codes online, check that colors are converted from RGB to CMYK. If the print file contains RGB colors, the colors chosen by the automated CMYK conversion in the printing house can vary considerably from those that were converted. The same also applies to the automatic conversion of spot colors into CMYK. To protect the printing surface or to get a brighter result, it’s possible to coat printing matter with varnish. It’s possible to use both matte and glossy varnish. It’s recommended to use varnish with spot silver and gold. It’s possible to use spot varnish to add an effect. Mark spot varnish in the print file on a separate page or with the printed matter using a separately indicated 100% color (spot). Consult with us about paper and varnish. The print file is a PDF, created according to standard PDF/X:1a (2001), has preferably passed the preflight check with the use or Adobe Acrobat Pro or PitStop without errors. It’s recommended to show the format of the printed matter and how much the bleed is in the file name (e.g A4_letter_210x297_3mm.pdf). Then it’s easy to associate the file with the order. We make printing plates using CTP technology and that’s why we make the imposition from the file ourselves. Coloration of the print file must be done with either CMYK, spot or CMYK+spot colors, depending on the order. 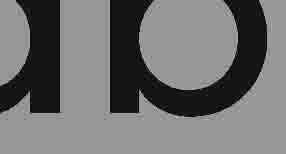 Text, page numbers and other design elements that cannot get lost during post-processing (stamping, cutting, folding, binding, etc.) must be located at least 3 mm from the edges of the clean format. In case of printed matter with complex or ambiguous post-processing, send a model or a video with the file to rule out any possible misunderstandings. Markings for folding can be added, but they must be outside of the clean format, in the bleed. Do not add ICC profiles of the file. There must be a 10 mm clear space (printing machine „gripping area”) in at least one edge of envelope printing. Files’ compliance with the technological conditions is checked in pre-press. Materials that are presented by the customer but do not comply with the conditions will not go straight to print. To ensure quality of the printing, the printing house has the right to make changes in customers’ files. Customer will bear the costs of amending a file that doesn’t comply with the conditions in pre-press. Print quality warranty doesn’t apply to files that do not comply with the printing standard. Resolution is calculated using the formula dpi (ppi) = 2 x lpi. For example, 1x coated paper is printed on with 150 lpi raster, this means the resolution should be 300 dpi (ppi). Optical resolution ie resolution (dpi/ppi) must be equal to twice the screen raster frequency (lpi), but definitely not less than 200 dpi (ppi). Pre-press control system can’t identify digitally increased resolution. Recommended resolution ensures sharp images and standard quality in print. Increasing or decreasing vector graphics (composed of points, straights, curves, etc.) does not change the quality. The most common formats are: .pdf, .eps, .ai, .cdr. Image or raster graphics consists of small pixels, that form an image. The image file cannot be enlarged without losing in quality. The most common formats are: .jpg, .tiff, .bmp, .png, .gif. All the fonts must be included in the PDF file (embedded) or transformed into objects (outlined, curved). Layout or clean format of the printed matter is located exactly in the center of the page, there is added bleed 3-5 mm equally from each edge. In case of 3 mm bleed, A4 print file is 216×303 mm and a 90×50 mm business card with a 3mm bleed from each edge has a print file of 96×56 mm. There is no need to add cutting marks, indicia or color bars to the print file, we will add these in imposition. Design elements that reach cutting lines must extend over the edge of the cutting line: 3 mm in case of brochures, adhesive bound booklets-books and 5 mm in case of staple bound booklets-books. The bleed is necessary to avoid the appearance of white areas due to displacements resulting from folding, binding, cutting, etc. 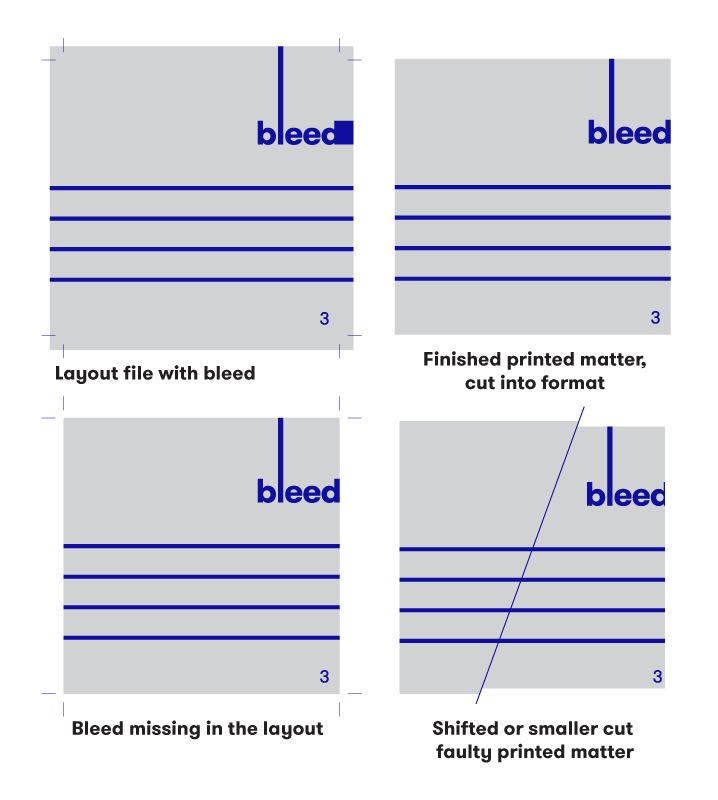 The bleed must already be taken into account when preparing the layout file of the printed matter, placing components, photo framing, because otherwise something important may go missing during cutting or post-processing. The bleed is needed for all background surfaces, images or any objects that reach the edge of the printed matter. Additionally, ensure that important elements of the printed matter are located further than 3-5 mm from the edge. Even the smaller tolerances in post-processing bring out parallel lines and frames near the edge of the sheet. Overprint objects are on top of lower objects in print. It is recommended to apply overprint with black texts, lines and small objects. It is not recommended to use overprint with larger black surfaces. An image or colorful surface will shine through a large surface. 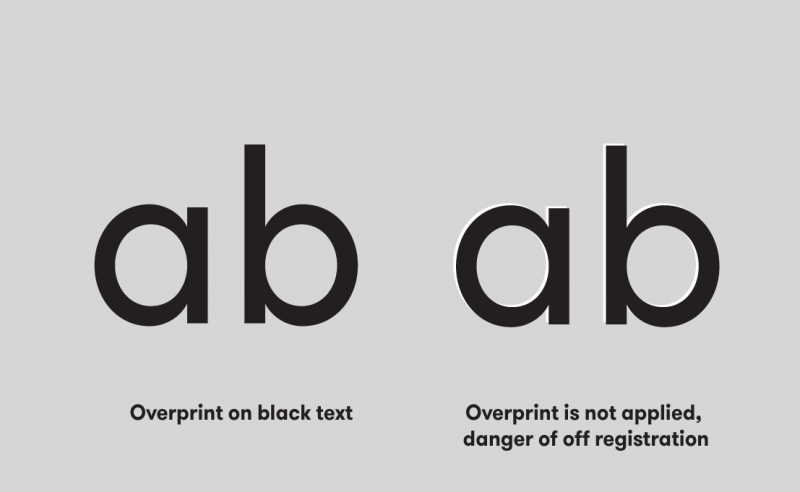 In that case, four-color black or black without overprint should be used. Four-color black also ensures large full black surface, using only black, the result will be greyish black. Dangerous mistakes: applying overprint for a white object on a colorful background or on different colorful objects results in the loss of the white object and the colorful object changes color, you get an undesired third shade of color. In case of spot color, you get a shade that does not exist in the catalog. If the file uses overprint on colorful objects or other different effects are desired, please inform pre-press. In case of bound printed matter, present the contents as well as cover pages as separate pages, in the correct order and in a single file. Several languages with replacing the black printing plate. For example, three different languages have the same colorful background design. This way it’s possible to save printing plates and time. In case of staple bound, page creep must be considered – middle pages are a few millimeters narrower. The exact measurements depend on the specific paper and the number of pages. In the layout, objects that are located close to the edge of the format must be considered: page numbers, frames, details which dimensions after cutting into format are different on inner and outer pages. If there are no texts on images that transition from one page to another it is possible to compensate the creep by moving middle pages inward. In case of adhesive bound, the spine of the printed matter must also be considered and separately designed, if needed. The thickness of the spine comes from the thickness of the paper, not its weight in grams. The correct thickness for the spine musts be calculated using the specific paper of the cover and the content. Consult with us! In case you know the thickness of the spine, the cover and spine may be combined on the same page. When designing adhesive bound printed matter, it must be taken into account that the bound edge of the content page is not fully visible/readable. 5 mm of the image on the cover design and the design of the first/last page, and 2-3 mm of the image on the rest of the pages is lost. Special consideration must be given to the image transferring from content pages or from the cover to content pages, or to the titles in the text part. When making the layout and design it must be taken into account that the edge with the spiral is perforated. The center of the holes (3.5×3.5 mm) is located 5.5 mm from the edge of the sheet. Press tool design must be in vector – stroke, not „fill” and definitely do not create the press tool design as an image. Use a continuous line: red cuts, green is a groove and yellow is perfo. The design consists of one three-page file or three separate files, where only the press tool design, the design with the print, and the print file are shown. Be sure to check the presence of bleed.